Sprinkle both sides of meat lightly with salt, pepper, and rosemary. Vacuum seal each steak in a cooking pouch. When ready to finish, put the peppercorns into a shallow plate and have ready. Remove the steaks from the pouches and press each side in the peppercorns to coat. On the stove top, melt the butter in a skillet over high heat, add the garlic, and brown the surfaces of the steaks in the fragrant butter, about 30 to 60 seconds on each side. Remove steaks to a warm platter, slice and serve. 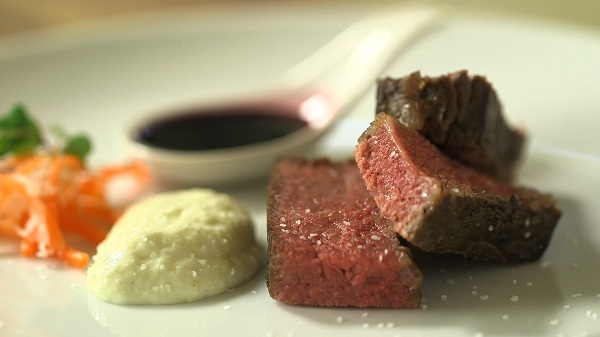 Suggestions for serving: Sous Vide Cauliflower Puree, Blueberry Balsamic Reduction, and Carrot and Daikon Quick Pickle.